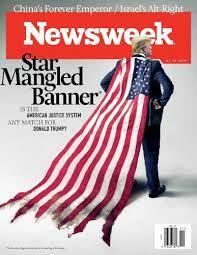 Newsweek Cover 3/16/18: Is the Legal System Up to A Trump? Much of what can charitably be called irregularities in Trump's business past are public, but he has always managed to negotiate or settle his way out of trouble. Now, Mueller's lawyers with subpoena power will be able to go far beyond what Johnston and other investigative journalists have already turned up. With three members of Trump's campaign (Rick Gates, Michael Flynn and George Papadopoulos) cooperating with the special counsel--as well as another, former campaign manager Paul Manafort, under indictment and facing decades in prison--the president has never looked more vulnerable. Yet some analysts worry that Trump--if he in fact committed a crime--could still get away with it. The president is a singular figure in the annals of American politics, and his critics fear that the U.S. legal system is not up to the challenge, or that perhaps only changes in politics and policy can actually impede someone like Trump.